You simply need to slow down, take time, and look. 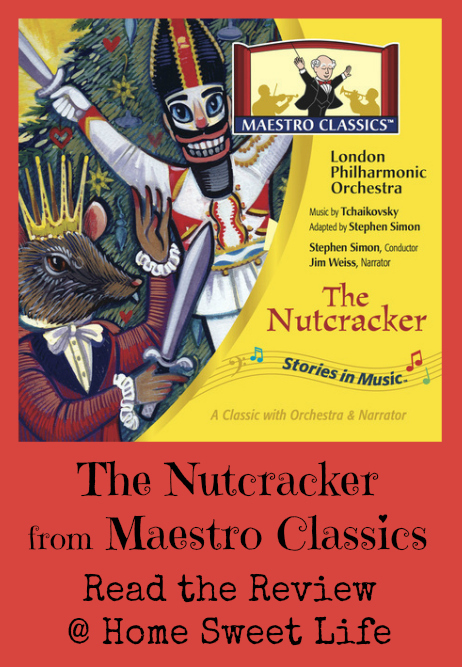 The Nutcracker on CD, from Maestro Classics, is a beautiful retelling of the classic Christmas story. The story is narrated by Jim Weiss, the professional story teller whose voice is familiar to many. Mr Weiss tells the story piece by piece with great skill to help you see the whole story happening in front of you. All of the dances, music, and familiar characters are there, from Clara to the Sugar Plum Fairy, with everyone in between. The CD is produced as a chapter a song, beginning with an introduction to the story and a brief biography of Pyotr Tchaikovsky. The story goes on in good style after this, with both Mr. Weiss’ narration and the music itself. You will find yourself recognizing many of the songs and enjoying the colorful tale they tell. It’s definitely a good car trip story. The CD comes with a booklet that contains a description of each scene, a very basic piano piece ‘Overture to the Nutcracker’, and pages about the harp, ballet, and Tchaikovsky, along with word puzzles based off of the story. The story is good for all ages, from younger children who will love the magic, candy, and magical creatures, to older students who can appreciate Tchaikovsky’s genius in his music. Definitely family friendly and lots of fun, this is a great addition to any CD collection. Maestro Classics CD’s are recordings of performances by the London Philharmonic Orchestra. They focus on the “Stories in Music(TM)” and have a dozen titles to choose from. The Nutcracker CD is an adaptation of the original score, and runs just under one hour. The original is about an hour and a half. 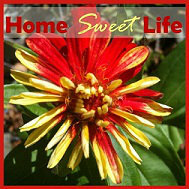 The Cd is geared towards children 5 and up, and families. Our girls are 15 & 17, yet they still enjoyed this masterful production. It has been a couple of years since we’ve been to see The Nutcracker ballet performed, and not far into our first time listening to this CD did one of the girls ask if we could go see it again this year. Having Jim Weiss narrate the story behind the music helped me tremendously. Either I didn’t know, or had forgotten, parts of the story. The narration opened my ears to the details of what I have seen performed onstage. Even if you’ve never experienced the ballet of The Nutcracker, your whole family can enjoy this CD. We have listened to it in the car several times, and recently, I’ve been hearing one or both of the girls playing some of the music on our piano. Tchaikovsky has always been one of our favorite composers. The booklet that comes inside of the CD case includes several things to help your family understand the story and more thoroughly enjoy listening to the beautiful music. It includes a listing of the 16 scenes of the ballet, and what occurs in each one. Next is a section giving a brief history of ballet. It also includes a simple 8 measure section of the Overture to The nutcracker, as well as information about the harp, and Pyotr Ilych Tchaikovsky. The booklet concludes with a couple fun games for younger children, and the listing of the length of each track on the CD. Overall? We loved this retelling of The Nutcracker. Not only do I foresee us listening to it time and time again, I expect the girls will probably pack it in their bag when they go to kid-sit. The Cd retails for $16.98 and includes free shipping, or you can purchase the mp3 for $9.98, and receive the booklet as a PDF download. This was our first experience with Maestro Classics, now we know why they're a favorite of so many families! They provide free curriculum guides to go alongside each of the Maestro Classics CDs. These can help you incorporate music into almost every subject. The Crew also reviewed Peter and the Wolf from Maestro Classics. Click the banner below to read all the reviews. Most homeschooling Moms will admit that they know they need to plan for their children’s education. The problem is: you’re not always endowed with great planning abilities the moment you decide to homeschool! 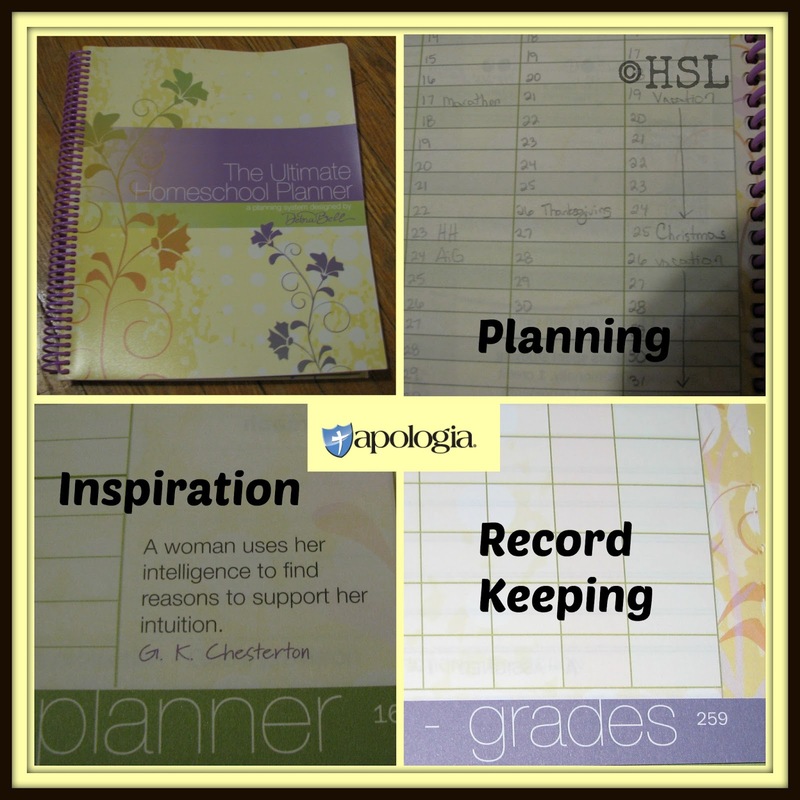 Whether you’re an expert planner or a novice, there are several things to love about The Ultimate Homeschool Planner (Yellow Cover) from Apologia Educational Ministries. The planner is also available with an Orange cover or a Blue cover. I received the planner with the yellow cover for this review. Apologia has updated The Ultimate Homeschool Planner by adding extra weekly pages so that those who school year-round won’t run out. One of the things that has always been my favorite about this planner (I’ve used it before,) is that it is undated. Being undated allows the freedom to start using it whenever you want without wasted pages like often happens in a traditional school year or calendar year style planner. Fear not, you’ll get your pages dated correctly - there are annual calendars in the front of the planner that go through the 2022-2023 school year. This spiral-bound planner has a sturdy plastic cover with pockets in the front and the back. At 280 pages, this is not just a planner, it also contains several tutorials on how to plan ~ an awesome addition for those of us born without innate planning abilities! I’ll start at the beginning of the planner and we’ll work our way through it together. 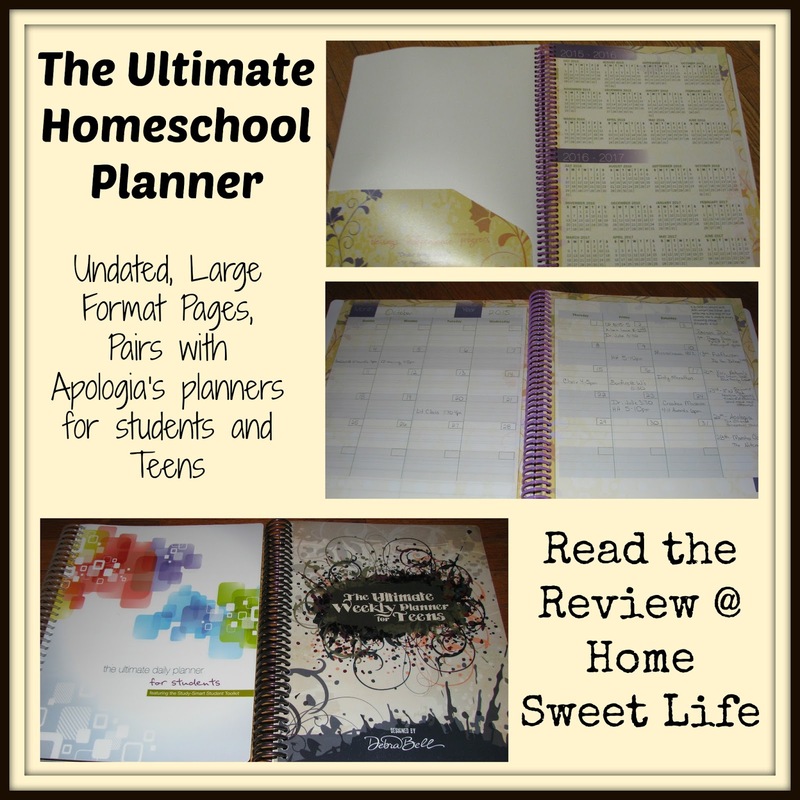 The Ultimate Homeschool Planner with the yellow cover is printed in muted tones of yellow, purple, green, and sunset orange. If you prefer brighter colors, you might want to look at the planner with the blue cover. Liberally sprinkled throughout are Scriptures and inspiring quotes. There are loads of tutorial pages in the front of the planner to show you how to use the planner, and give you encouragement to prayerfully prioritize your family’s plans for the year. As a long-term home educator, I can use all the encouragement I can get, especially when it points me to prayer. It is all too easy to set a goal that is either too easy or too hard because you’re in a hurry to fill the boxes in your planner and get started. Start here in the intro pages and realize that time spent planning is time well spent. You will notice the subtitle on page 6, it says Enjoy a God-ordered Life. You’ll only find that enjoyment while homeschooling if you take time to pray, and then to plan. If you’re new to homeschooling, get your kids something fun to do for a couple of days while you work on reading through the tutorial pages and doing some beginning planning. This planner suggests dividing your planning time into yearly, monthly, and weekly planning breaks. Even if you’re not a huge plan-ahead Mama you can get a lot of benefit from using this planner. More about that later. The first planning you’ll want to do is the two-page year-long grid. This is an opportunity to block out times you know you’ll be busy (like your husband’s vacation, or summer camp,) giving yourself a realistic look at how much time you might have available to you for homeschooling. The next set of planning pages covers the character and academic goals for each of your children for the upcoming year. This planner has space for up to six students. Then stop and work on the Family Priorities page with your husband. Remember that we’re looking for a God-ordered life, not just a busy one! Finally, utilize the resource list pages for each of your students. Next up are the monthly calendar pages. The large size of this planner gives you plenty of room for writing in appointments and meetings. The calendar pages actually come with six weekly lines, so if you want to include the first few days from the next month at the bottom of the current month you can - a preview of things to come! 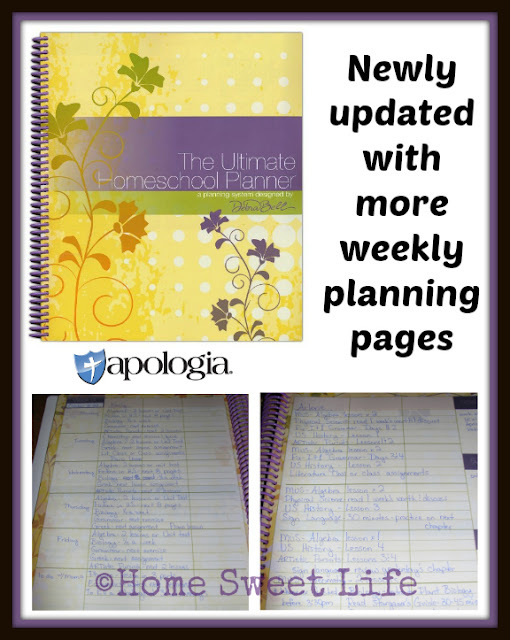 The bulk of The Ultimate Homeschool Planner is the weekly planning grids. Before each 2-page weekly grid is a 2-page overview section where you can record your Bible plan, battle plan, prayers, hospitality/ outreach plans on the left page, and on the right - the week’s memorable moments, achievements, and evidences of grace. On the weekly planning pages is a seven by six grid, along with a column for notes, needed supplies, and appointment reminders. You can customize these pages multiple ways. There are examples of the two most-used methods in the tutorial pages in the front. Because our girls are both in High School and use a block-style schedule, I customized the weekly layout with Emily on the left page and Arlene on the right page. I typically plan their schoolwork by the month or at least for two weeks at a time, and then they are responsible for getting it completed and recorded. Because that means I will have extra weekly pages, I’m using them to plan out my upcoming blog posts! The Ultimate Homeschool Planner ($29,) is designed to integrate with The Ultimate Daily Planner for Students ($19,) and The Ultimate Weekly Planner for Teens ($19.) The last time I used the Ultimate Homeschool Planner I purchased these two planners for Arlene and Emily to use. These two smaller planners help you teach your students how to track their progress and record the time they spend on their schoolwork. In the back of The Ultimate Homeschool Planner there are pages (for up to six students,) where you can record scores, keep a reading list for each student and record field trips and outside activities - like volunteer work. The last few pages of the planner include tips for raising an independent learner, as well as motivating a reluctant learner. Then two pages are dedicated to learning styles and study skills. Finally there is a grid showing you a sample High School plan, as well as a blank grid where you and your teen can chart their High School plan. What if you’re not a big plan-ahead type of Mama? Do some broad overview planning (yearly and monthly,) and then use this planner as a record keeper of all your family does. It is always a good idea to keep track of your children’s accomplishments. I wish I had kept a reading list for each of the girls when they were younger. With this planner I have plenty of room to record what they’re reading now. By the end of the year I may need to use one of those extra planning pages . . . our girls read a lot! 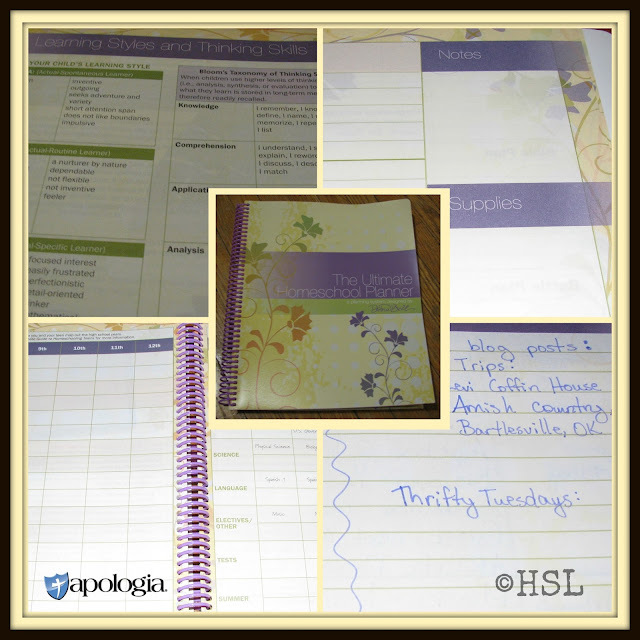 Do you need help to prayerfully prioritize you home and homeschool? 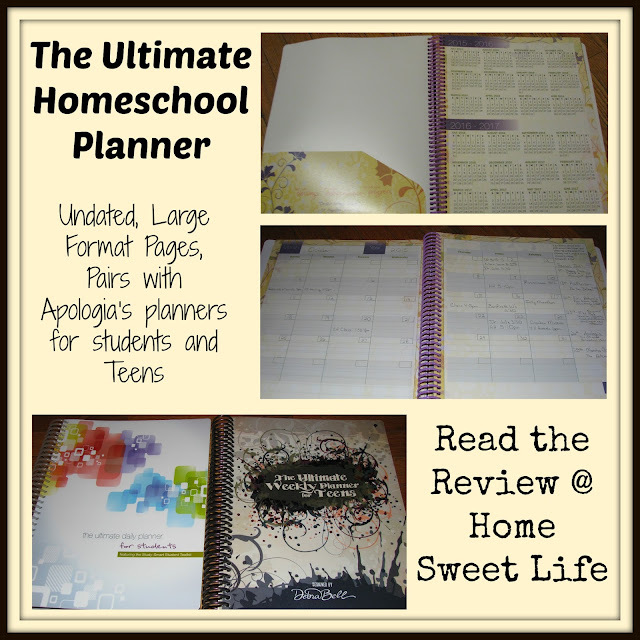 Use The Ultimate Homeschool Planner to see the big picture first, and then divide the work into manageable pieces. Remember, your child’s character is just as important if not more so than their education. Don't forget character training in the midst of the everyday lessons. Visit Apologia’s website to see the various color schemes available for The Ultimate Homeschool Planner. Click the banner below to find out how other Crew members used their planners! When you teach, there are times when you want a little extra help. 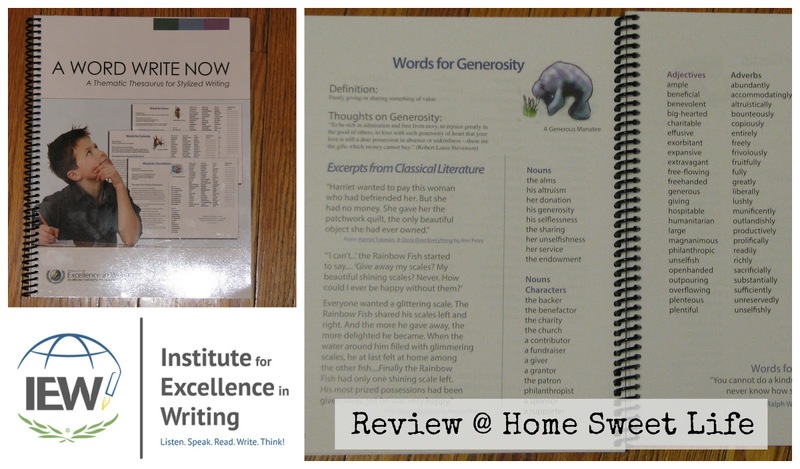 The Institute for Excellence in Writing (IEW) is a favorite option for many teachers and families when looking for help with writing or grammar. Besides their intensive writing curriculums, IEW offers teachers several additional options for classroom resources. Recently we’ve been reviewing three of these additional resources: Teaching with Games Set, A Word Write Now, and Timeline of Classics. Teaching with Games ($29) is a 2 DVD/ 1 CD-ROM set that contains a CD-ROM with the complete E-Book of Teaching with Games, as well as two DVDs of workshop demonstrations of how to utilize the various games. 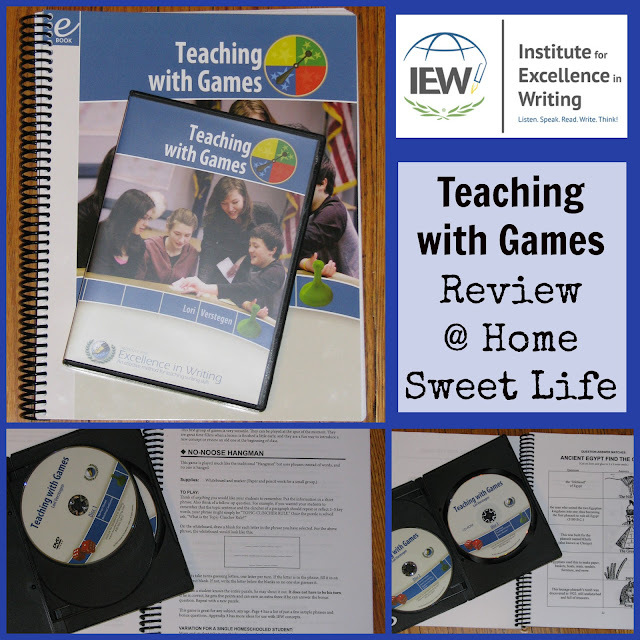 IEW also has the Teaching with Games book available in a printed form ($19) if you prefer. This E-book contains about two dozen games, many of which offer suggestions for adaptation, making your options almost limitless. IEW was kind enough to send us both the set and the printed book for our review. As a teacher, I would want to have the printed version for quick reference, and the E-book for ease in printing multiple copies of the various games. Although geared towards use in a co-op or classroom setting, several of these games could be used at home as well. I would highly recommend this resource for classroom teachers. The games presented are for various subjects, including history, geography, math, and science. For teachers who like to keep their students actively learning, these games can add some fun without a lot of pre-planning. None of these games are difficult to understand how to play. The Workshop DVDs show teachers actually using and playing several of the games, as well as the facilitator giving hints about the best way to set up the game boards. The Teaching with Games E-book is over 100 pages of instructions and sample game boards and pieces. It is all black and white for ease of printing. The game pieces have simple black outlines to make it easy to use a paper cutter and get them all the same size. Of the many games suggested, I plan to use Geometry Bingo the most. In my past experience, I have found students love playing games in the classroom. This resource makes it simple to incorporate some games into your everyday teaching. A Word Write Now ($35) is a thematic thesaurus that focuses on helping students expand their choices for describing character traits like generosity or courage, as well as words that describe appearance, color, size, and texture. These thesaurus pages are divided into three sections for student use: character traits in section A, words to describe in section B, and words for movement and the senses in section C. This is a spiral bound book printed in color. Although originally written for upper elementary and middle school students, Arlene has found this resource helpful as a High Schooler when writing her stories. Because this is a thematic thesaurus, it includes a wide range of options for each word. It also includes cute cartoon pictures in the Character Traits section such as a Wise Walrus wearing a monocle, or a Courageous Penguin standing on a tall rock clutching his teddy bear. Each word in this thematic thesaurus is given a two-page layout and includes not only similar words, but also includes the definition, thoughts about the word, and experts from Classic literature to remind the student of how the words have been previously used. Under Words for Generosity, you’ll find an excerpt from The Rainbow Fish - where he gives away his glittering scales. There are nouns, adjectives, adverbs, and verbs that all relate to generosity. Your student can find suggestions to use in their own writing such as: her unselfishness, the benefactor, charitable, abundantly, or bequeath to name a few. There is also a section of blank lines where students can add their own words to the page, making it uniquely their own. Included in the book is a blank two-page spread that can be photocopied so the student can think of their own topics and gather words. In the back, section D includes Teaching tips, transition words not related to time, prepositions, literary genres and a section on Literary Devices. Here is Arlene’s review: I like the word book. It has helped me a lot with my writing I could look at a normal thesaurus but A Word Write Now is more fun, and more funny, which I know will help younger kids. You look up curious and a list of other words is helpful, but it is more fun to look up the Curious Catfish and find the definition, some quotes, and excerpts from classical literature, as well as the list of other words divided by nouns, noun characters, adjectives, adverbs, and verbs, as well as space for words that you may find yourself but are not listed. A Word Write Now starts with words for character traits, then has descriptive words, then words for movement and the senses. A Word Write Now is a resource you will want to buy early on in your student's career because they will use it often. I highly recommend it for families and teachers who utilize IEW’s writing curriclums, but I also know it would work well with any other writing curriculum because of its unique format. Within each time period, good and great books, quality historical movies, and audio storytellings are listed. They are listed in order that the story takes place in time, with a brief description being included on most titles. It includes the full title, the author (and their website if they’re still living,) and a qualifier of whether the resource is geared towards Elementary, Middle School, or High School. Several book are listed for all three age groups (E,M,H,) while some, especially those of sensitive topics, are listed only for High School. Just because a resource is listed for Elementary, don't overlook it for your older students. Many of the audio storytelling titles listed from Jim Weiss are on the shelves of our High Schoolers and are listened to often. Who is this resource geared towards? Everyone! I think all families would benefit from having a copy of this fabulous book to look through for choosing books to read-aloud. If you are a Charlotte Mason or Classical Educator, I cannot recommend this highly enough! It will save you literally hours of research. If this book has been around a decade ago, it would have quickly been put on my favorites shelf! As a Charlotte Mason style family, I have often been at a used bookstore, or homeschool convention looking through books wondering if they were worth our time and money. I often saw titles that friends had recommended, but couldn’t remember if they were for elementary or later years. This resource takes the guesswork out of that! With over 80 pages devoted just to the timeline, you have a wealth of good, solid selections to look for. If you are teaching history to multiple ages, this is a gem you will want on your shelf…or in your traveling bag! Are you going to study King Arthur next week? Find multiple listing appropriate for each age group on page 18. Wanting to study the French revolution without giving your elementary aged children nightmares? Turn to page 45. I found it encouraging to find so many titles we had already read listed amongst the pages of this book! 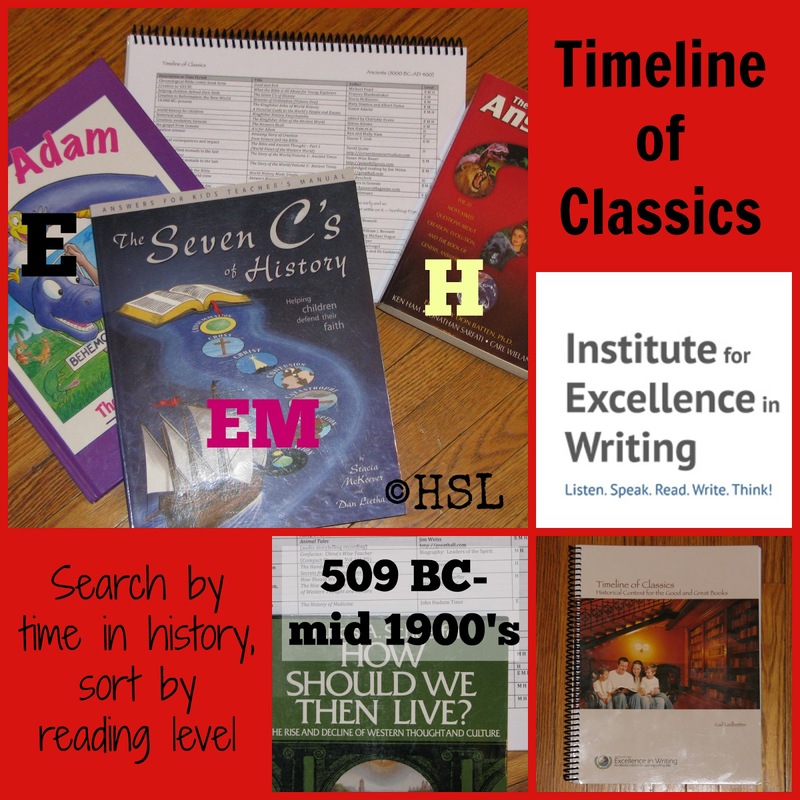 Arlene (15) has been using Timeline of Classics since it arrived. Here is her snippet: The Timeline of classics might be a bit confusing at first if you are looking for a book that is arranged by the year the book was written. That is not the case, as they are arranged by the year they take place. This is helpful if you are looking for books that take place in a specific time period whether for fun or pertaining to a class. Take a look at all of the great resources available from IEW, there is a wealth of knowledge to be found and shared. To read reviews from other Crew members, just click the link below! For this, our 500th post, I wanted to share something that has been on my heart lately. The world finds us strange when we are different. 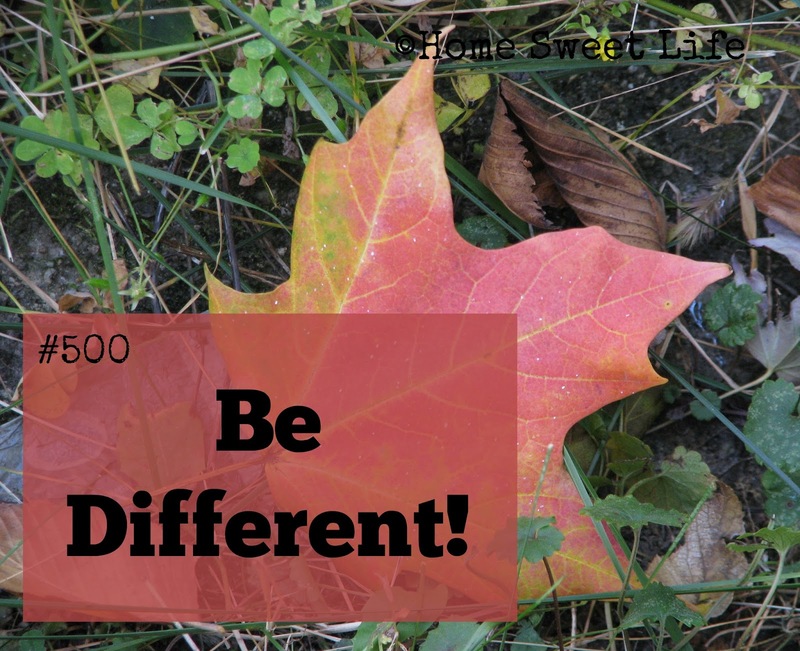 We don't need to be different just for the sake of being different, or to draw attention to ourselves. We need to be different because God made us each unique. For example: Last week I was leaving town to run some errands. I knew I would be gone a couple hours so I stopped by Starbucks and used the gift card one of my friends gave me last year. You would have laughed if you could have seen the look on the face of the male barista when I said I just wanted a scone. What, no coffee? No, no coffee. See the maple leaf in the picture above? God made it different too. It was one of thousands on our tree, yet is shines its own beauty just as well or even better as an individual as it did while still on the tree. Being different isn't about drawing attention, its just about being yourself. If you're struggling with who you are, ask God to show you who He wants you to be. I'm on that journey myself. So far? I know it doesn't involve coffee. It involves losing my selfishness and finding myself kept in God's mighty hands. 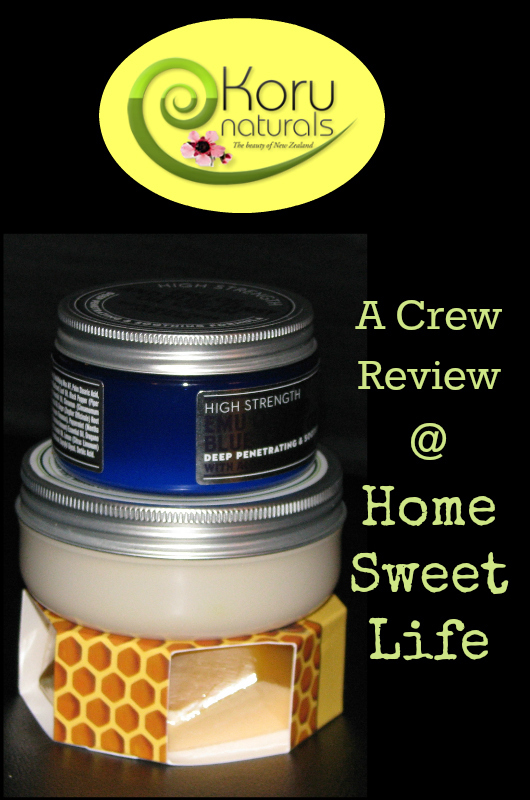 Koru Naturals ~ Another Happy Crew Review! As a reviewer, I will readily admit to having some favorite companies. I enjoy seeing their names pop up on lists for possible reviews, or receiving an email from them about new products. 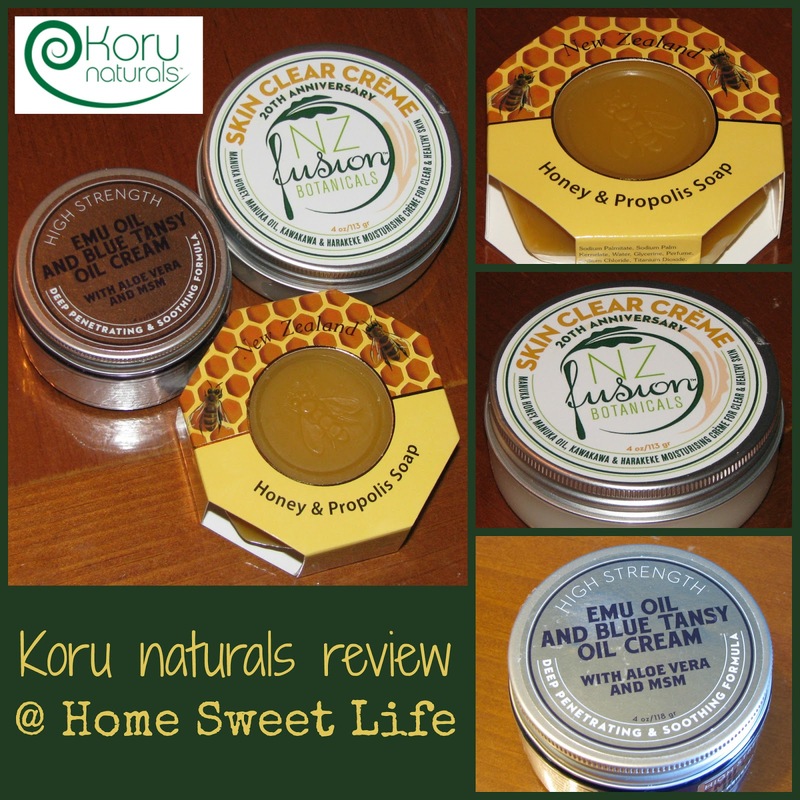 One of my all time favorite companies to review for is Koru Naturals! 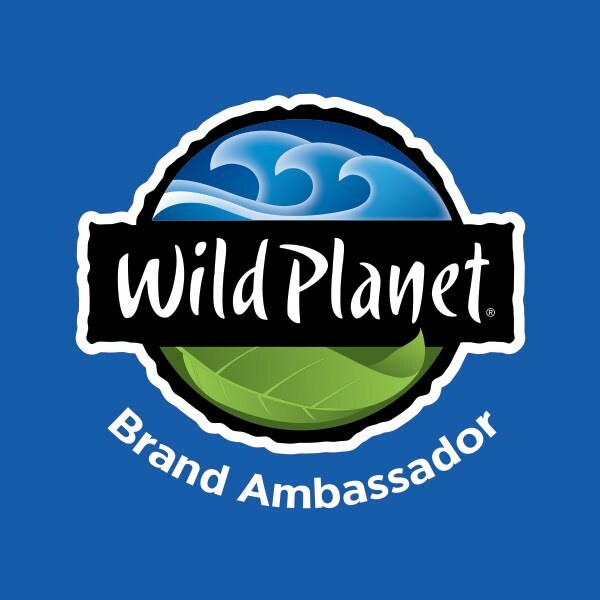 This time around we were blessed to receive three of their quality products: Manuka Honey Propolis Soap, Skin Clear Cream, and Emu Oil and Blue Tansy Oil Cream. Note ~ this might be a tad longer of a review than usual, as we want to share the highlights of each product. There will be a section for each product, but first, a little about Koru Naturals. Get a cup of tea to sip, or grab a piece of fruit to nibble on, these are superb products worth your time! Koru Naturals has been around since 2002, helping customers in the US, Canada, and parts of Europe and Asia experience the benefits found from using natural-based skincare (and haircare) products. When our girls were little, I began a search for skin care products that did not rely on petro-chemicals as their main ingredients. Back then, using a nature-based approach to skin care might get you the nickname of Granola, today you’d be labelled a Crunchy Mama. Whatever nickname it garners, the principle is still the same. I want to use products that utilize the healing properties God has put in nature, over products man made in a lab. From their unusual soaps of New Zealand section, this Manuka Honey Propolis Soap smells divine. It comes in a cute little wrapper reminiscent of a bee hive. What is inside the wrapper will have you hooked in no time. This soap is a great cleanser, while being gentle on skin. Honey is a wonderful defense against bacteria, and Propolis is currently being studied for its anti-inflammatory properties. I enjoyed using this as a general bath soap. Know that it will need to be kept in a well-draining soap dish so as to not turn to mush. The soap is quite large at first (almost 5 oz) and might be difficult for small hands to get a good hold on. Do not be discouraged by this, we have found it to lather nicely throughout its usage, so you might consider cutting the roundish bar in two to make it easier for small hands. This could be used as a face soap, especially by teenagers who tend towards oily skin, as it deep cleans gently. It would be wonderful to use as a hand soap in the bathroom or kitchen, partly because of its cleansing, partly because it smells so good! NZ Fusion Botanicals has added even more naturally healing ingredients to this 20th Anniversary version of their Skin Clear Cream. It includes honey, manuka (tea tree) oil, and a host of other healing ingredients. Note: it should not be used during pregnancy. Also, you should test it out on the inside of your arm for at least a day or two before using it on your face. Some people are sensitive to manuka oil. We tried the skin test first. We had no problems. Emily and I have both been using this daily for just over a month. 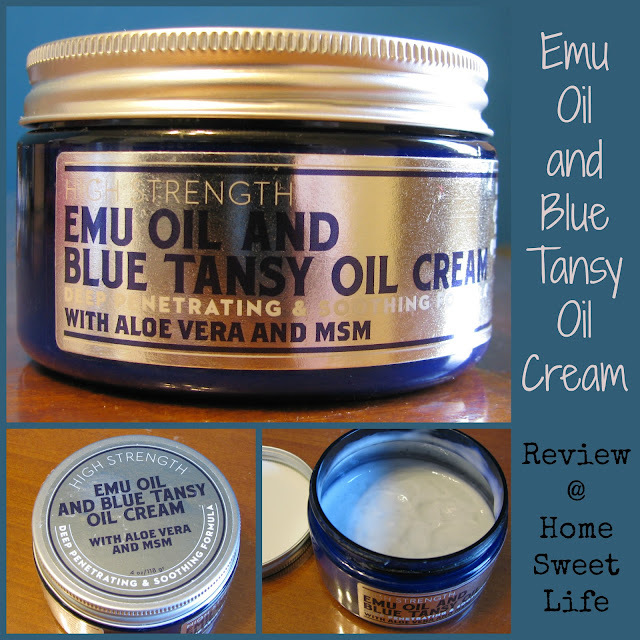 It has really helped my skin to retain moisture better, and has helped clear up Emily’s blemishes. The first ingredient is Aloe leaf juice, making it a featherweight cream that glides over your skin. The jar comes with an insert to seal the cream in the jar & keep it out of the lid, as well as a small scooping tool so you don’t transfer anything from under your nails into this gentle concoction. Both girls have commented about its unusual smell. It is not a bad smell, just different than they are used to. The Skin Clear Cream includes several essential oils, and the combination is unlike any other I have encountered. I find the smell pleasant, if a bit strong, so when I use it again in the evenings, I try to remember to put it on at least 15 minutes before bed so it is not distracting whilst I’m trying to go to sleep. Emily has noticed that after prolonged use (more than a week,) you don’t need as much because it quickly improves the hydration level of your skin. I agree. I have also been using it on my décolletage area and have seen vast improvement in the texture of the skin. After about a week and a half of daily use on her face, Emily came up to me and said “Mama, feel my skin, its so smooth.” This is a huge compliment to the skin clear cream, as Emily has psoriasis and her skin is often dry and scratchy. With the success she has had with this cream on her face, I will recommend she try this on any small psoriasis spots that surface this Fall and Winter. Super Important note: NOT for use by pregnant women, or those who plan to get pregnant soon. Some of these ingredients do not mix well with babes. If you are pregnant, please choose one of Koru’s other quality products instead! This Tansy Cream is like an apothecary in a jar. When I read the ingredients list online I was shocked at how many anti-inflammatory and joint helping essential oils they pack into one product. If you’ve ever researched Blue Tansy oil you’ll know that it’s highly prized, seasonally available, and expensive! By mixing this potent oil with so many other quality healing ingredients, Koru Naturals is able to offer you a stupendous product at a fantastic price. I love this stuff!!! I joke with the girls that I need to go use my blue spackle every morning and evening to glue my joints back together! The Blue Tansy oil gives this cream a lovely light blue hue, and the mixture of essential oils gives it a delightful scent. I plan to use this product forever! It is recommended that you use this thick cream at least twice a day for the first 2-3 weeks, then as needed. You rub it into your sore joints. I had a lot of those, but they’re much better after a month of using this Blue Tansy Cream! How well does it work? Amazingly! It has been at least six months since I could sleep in any position besides flat on my back. My right shoulder would hurt too much to even fathom laying down on it, and if I tried to sleep on my left shoulder, the pull of gravity on my right arm would have me waking up in pain in only an hour or two. This cream arrived and I started using it that very evening. I used it three times a day for the first five or six days, and then I packed it in my bag for our camping trip. I awoke the second night at camp realizing I had fallen asleep on my left side…and my right shoulder wasn’t screaming out in pain. I played tennis several days during camp, and my elbow didn’t get any worse. Both of these were wonderful discoveries. It took longer for my right shoulder, but now I can safely sleep on my right side without waking in agony! Am I completely healed? No. Am I better than I’ve been in the past year? Most definitely!!! I had been concerned that I might be developing arthritis in my right shoulder, but didn’t want to fathom what that might entail. I am so blessed to have found this AMAZING product at such a critical time! You should read the entire ingredients list yourself. It contains so many great ingredients found in the natural world around us, without having to scour the globe to find and mix them yourself: Aloe Vera Juice, Coconut oil, Australian Emu Oil, Arnica extract, Sweet Basil Leaf Oil, Black Pepper Berry Oil, Roman Chamomile, German Chamomile, Eucalyptus, Ginger, Lemongrass, Sweet Fennel, and of course Blue Tansy just to name a few! At the time of this review, Koru Naturals is offering free shipping in the USA on orders of at least $35.00. The Honey and Propolis Soap is $7.90, the Skin Clear Cream is $19.20, and the Emu Oil and Blue Tansy Oil Cream is $14.80. You could try all three of these great products for $41.90 and receive free shipping! 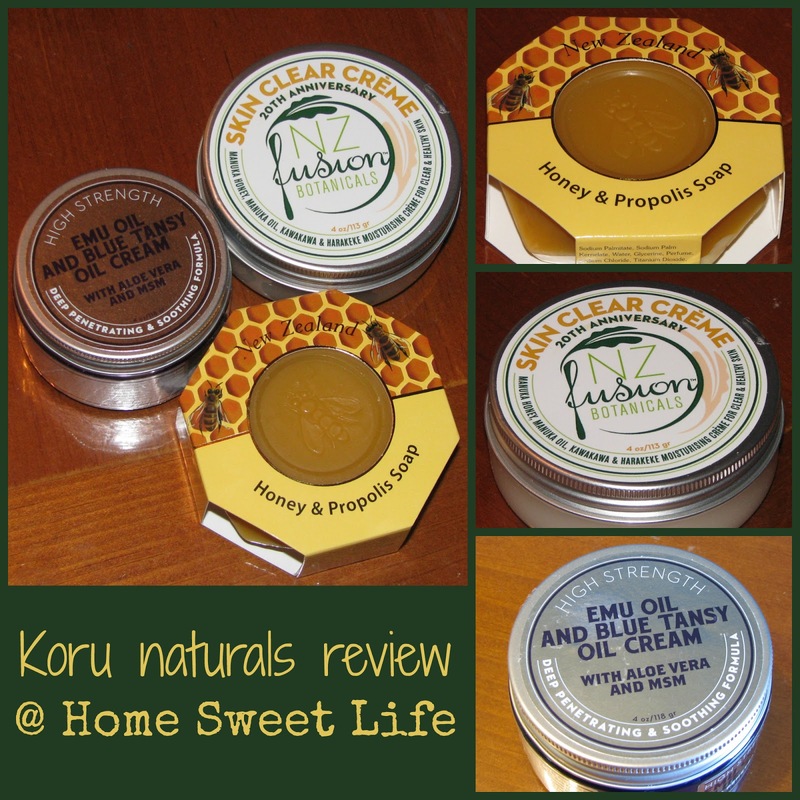 We reviewed other products from Koru Naturals back in the Spring. Click Here to read that review! The Crew has been busy reviewing seven different products from Koru Naturals this Fall, click the banner below to find out all about them! You can connect with Koru Naturals on both Facebook and Pinterest! Several times during each year, someone stops me and asks what it takes to join the Schoolhouse Review Crew. If you were one of those who asked... or you've been secretly wondering... now is the time to get busy on the application! 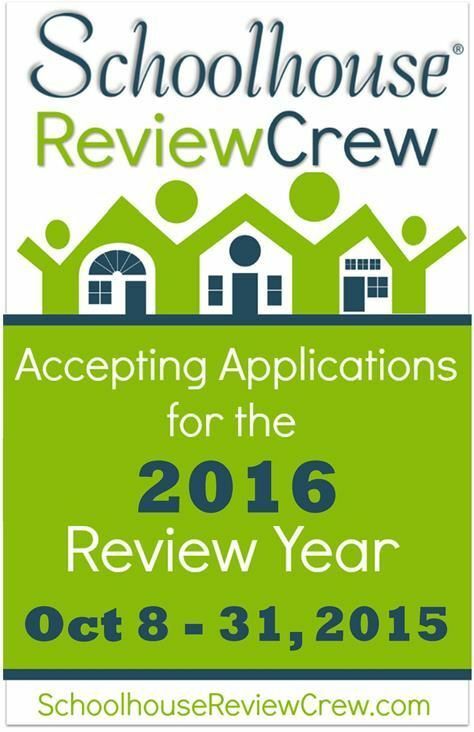 The Crew is taking applications for new members for 2016. You have until the end of the month ~ that's not very long, but plenty of time if you're already a regular blogger! If you're not regularly blogging, but have been thinking about whether or not you would like to be a reviewer, why not look over the application and see if it's something you're interested in working towards for 2017? There are some requirements to meet before you can apply, namely that you already need to be a regular blogger with at least a modest following, and you'll need to be homeschooling at least one child ... since the majority of what we review are curricula and other educational things. The application covers all the details. 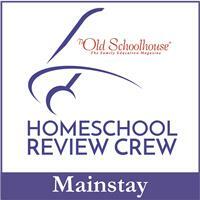 We've been on the Schoolhouse Review Crew for a few years now. It has been a HUGE blessing for our family. The girls have gotten to try a wide range of curriculum choices, and several of them have made it into the regular rotation for their home education. There have been products that met a specific need we had ~ like The Logic of English, and others that are just for fun ~ like Heirloom Audio Productions! The Crew has been a blessing to me as a blogger and a Mom. Being on the Crew has encouraged me to find my own voice when blogging and continually improve upon it. The friendships and support of other Crew members has been priceless. Getting to try out all the various products has enriched our daughters' home education and blessed us beyond measure when we've finally found things that "click." 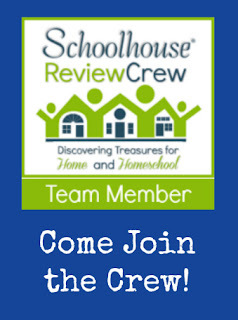 Click the banner below to get all the scoop on applying for the SchoolhouseReview Crew for 2016. This portion of Psalm 16 has been on my mind a lot recently. Often in the past, I have made the mistake of focusing on what we don't have, or what I wish we had, instead of being thankful for what we already have. Have you fallen into that trap? The world around us is screaming "More! More! More!" while the gentle voice of the Lord reminds us that He provides all we need. I want to keep my focus on the Lord being my chosen portion. I want to rest in knowing that He provides all of our needs, as well as many of our wants. When we look at the world at large, where people are persecuted, where children go hungry, where dictators rule with oppression, we are reminded of how blessed our own lives are. My life is simple, it is pleasant. Our family is intact, we are healthy. The boundary lines are quite pleasant right now. I know challenging times will come again. God has carried us through them in the past, I want to trust Him to carry us through them again. The boundary lines have fallen for me in pleasant places. 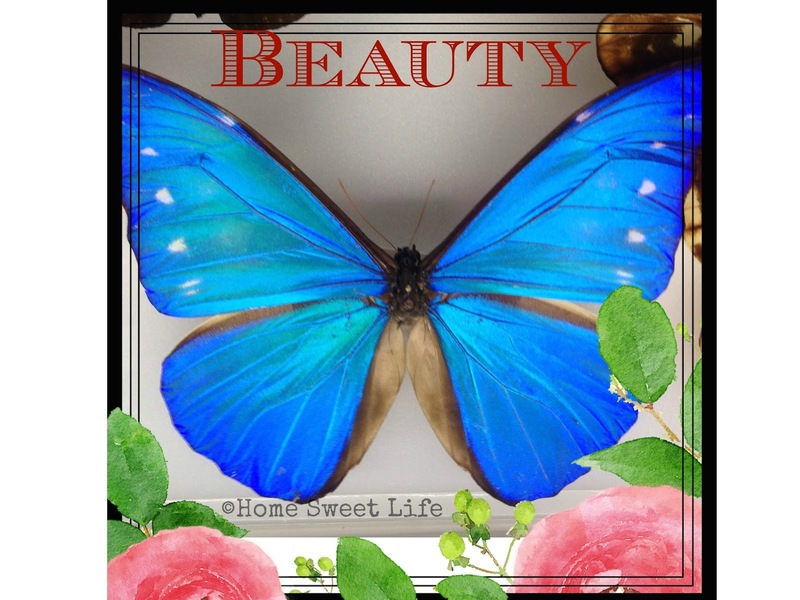 My inheritance is in Heaven, indeed I live a beautiful, blessed life. Want to find more encouragement from The Word? Visit the linkup at Counting Pinecones. Have you ever had a simple question change the course of your life? 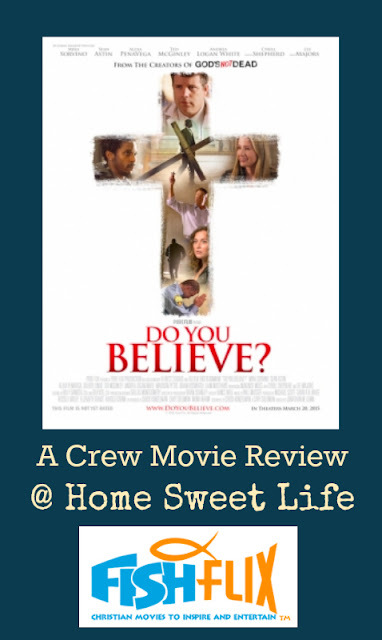 In our latest review ~ the movie: Do You Believe? ~ from FishFlix.com, a simple question sets the scene for a challenging and compelling two hour drama. This faith-based movie shows the intersection of a dozen lives. Do You Believe? follows the lives of a dozen people from a wide variety of backgrounds until the night when all of their lives intersect. These varied lives ~ a pastor and his wife, a homeless mother and her young daughter, a gang member, an older couple grieving the loss of their daughter in an accident caused by a drunk driver, a nurse and her husband the paramedic ~ all have insecurities and questions. During the opening scenes of the movie, a street preacher challenges the pastor with the simple question “Do You Believe (in Jesus Christ)?” This movie weaves a compelling tale of just how intertwined all of our lives are. It also asks the tough question ~ if you believe in Jesus Christ ~ how does that change your life? How should a Christian live differently than the rest of the world? As the movie unfolds, the Christian characters are challenged, and the unbelievers are confronted with the consequences of their actions. I don't want to give away too much of the story, because I want you to see this movie for yourself! This story is masterfully told and the presentation is compelling. The cinematic techniques used in this movie are as good as any other feature- length film I’ve seen in recent years. The girls (17 & 15) and I watched the movie multiple times, and I’m not ashamed to say we shed a few tears each time. The characters in the movie each have their own compelling and interesting back stories and current struggles. They serve as potent reminders that we each live a life that is much deeper than what the world around us sees on a daily basis. Watch this movie! The lineup of actors that includes Sean Astin, Mira Sorvino, Lee Majors, Cybil Shepherd, Ted McGinley and Brian Bosworth should be enough to intrigue you. However, I think the storyline is compelling enough that it could have been filmed with a group of unknown actors and still have been just as powerful. Do You Believe? is two hours in length and is rated PG-13. I concur that it is best suited for ages 13 and up. While the questions it raises are compelling for all ages, the presentation is not suitable for young children ~ remember, one of the main characters is a gang member, and the robbery and police chase are somewhat graphic. FishFlix.com is a great online destination for movies. Their tagline is “Christian movies to inspire and entertain.” Earlier this year we reviewed another great title from FishFlix.com ~ Unbroken DVD Legacy of Faith Edition. You can find dozens of other great titles on their website including God’s Not Dead, When Calls the Heart, movies from the Torchlighters Series, and The Drop Box. As of the time of this review, if you sign up for their email newsletter, FishFlix.com will send you a coupon for 10% off your first order. They’re also currently offering free shipping on orders of $35 or more. Now is a great time to stock up on some great movies for your family. To read about some of the other titles available at FishFlix.com, click the banner below for more Crew reviews.